In 1973 Intel introduced the 8080 microprocessor which was approximately ten times faster than their previous 8008 processor and substantially faster than designs before the 8008. The 8080 could also address a whopping 64KB of memory at the time. The 8080 paved the way for the personal computer because of the power and flexibility it offered. In 1975 a company called MITS introduced what was called an Altair kit in the January issue of Popular Electronics. This kit is actually considered the first personal computer by many. Included in this kit was an Intel 8080 processor, 256 bytes of memory, a power supply, and a front panel with an assortment of lights. Being a kit it actually had to be assembled though, and unlike today assembly required a soldering iron and not simply a screwdriver. Despite the required assembly, many as we’ve mentioned still consider the Altair kit as the first PC. In 1975 IBM also introduced what many call its first personal computer, the Model 5100. The 5100 had 16KB of memory, a built in BASIC programming language interpreter, a 16 line by 64 character display, and even a DC-300 cartridge tape drive for storage. The 5100 however ran for upwards of $9000 so it wasn’t exactly a mainstream computer system, and instead was used mostly by wealthy hobbyists. Come 1976 Apple Computer, a new company at the time, introduced the Apple I computer. Fun fact was its selling price, $666.66, selected by Apple cofounder Steve Jobs. The Apple I system also only consisted of a main circuit board screwed to a piece of plywood with no case or power supply included. Only a few Apple I systems were ever manufactured. However the Apple I paved the way for Apple’s amazing Apple II computer system introduced in 1977. 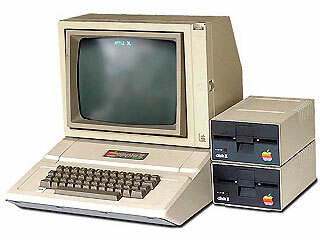 This Apple II actually became a dominant industry player in 1980 and it set the standard for the majority of important computer systems to follow including the original IBM PC. IBM on the other hand wasn’t sitting back doing nothing in regards to Apple’s success with the Apple II, see IBM really knew what a personal computer needed to have in order to be a success. It needed an open architecture, expansion slots, and a large support from third party hardware and software companies. And that is exactly what IBM set out to do, create an open architecture computer system. Welcome to the IBM PC, an open architecture computer system which literally caused a complete turnaround in the computer industry. On August 12, 1981 IBM introduced what many would actually call the first true personal computer, IBM model number 5150 or more commonly known as simply the IBM PC. It was created by a team of designers and engineers led by Don Estridge of IBM Entry Systems Division in Boca Raton, Florida. The IBM PC ran an Intel 8088 processor at 4.77 MHz, included 16 KB of memory that was expandable to 256KB, included one or two 160k floppy disk drives and an optional color monitor. Starting price tags were approximately $1,500. This original IBM PC became a huge success throughout the 80’s and because of this coined the term for what we know as the PC compatible computer of today.